to the JGSGB East of London (EOL) Group website! 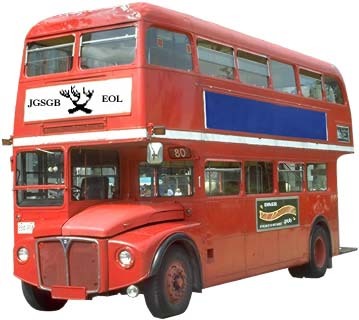 This site announces the JGSGB EOL's meetings for those in East London and Essex. 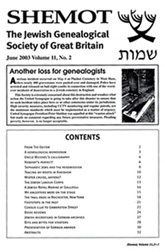 We are part of the Jewish Genealogical Society of Great Britain. The JGSGB EOL holds regular meetings in Gants Hill. Click and see the JGSGB's range of resources and membership benefits at the national website. Our aim is to help anyone with Jewish ancestry trace his or her family tree! STOP PRESS ... On 8th May 2003 the JGSGB, jointly with American site Jewishgen, officially launched the Jewish Communities and Records website in the UK at the London Metropolitan Archives. This project aims to collect, preserve and put online genealogical records from Jewish communities around Britain for the benefit of genealogists worldwide. All aboard for the JGSGB East of London Group! Click on the bus for Mapquest map and directions! Keep up-to-date with our events by joining our mailing list! The JGSGB, a secular society, has groups nationwide to help anyone find out about their Jewish ancestry. To find out how to join the JGSGB and discover your Jewish family's history, click on the logo below! Do You Have Space for Our Poster on a Noticeboard? Do you know a notice board where a poster for the JGSGB EOL will be welcome? Posters for downloading below! 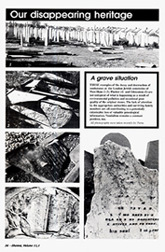 These posters are in Adobe Portable Document Format (PDF). Click below to download free Adobe® Reader® software to open these files. Elliott Porte and Raymond Montanjees will demonstrate ways of discovering precious clues to your family tree in Jewish cemeteries. Discover the treasures of the graveyard! Whatever your origins and however little or much you know, we'd love to see you at our meeting and discuss your Jewish family tree! Join Elliott and Ray and discover your ancestors beyond the grave! 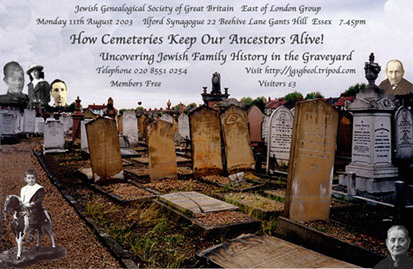 Historic Jewish cemeteries are a part of British heritage and JGSGB members are actively trying to help record and preserve these sites. Our October meeting will feature the welcome return of Jewish genealogy speaker Richard Pearlman. Richard set the East of London Group's ball rolling when he gave a fun and fascinating talk at our inaugural meeting. Bookmark this website for further updates! "We Don't Spell Our Name that Way!" Our last meeting was "Breaking Out of Genealogy Groundhog Day", one of our popular "Helping Each Other" workshops. This cooperative meeting proved a winner, giving a host of useful tips and suggesting solutions for some knotty genealogical problems. Queries covered three continents with several people finding possible connections. Those attending could also browse through books and cds covering many aspects of Jewish genealogy. A big thank you to all those who came, saw and contributed to another successful meeting!